On news.com.au today, police have launched an investigation after a roofing contractor was fatally electrocuted while working at a home in Sydney's west, a total fire ban is in place across NSW as hot and windy conditions are set to batter the state, and a P-plater has narrowly avoided catastrophe after pulling in front of a truck on a highway. "We (won't be able to) get loans because we've got nothing to borrow against, none of us have got anything left," she told AAP. 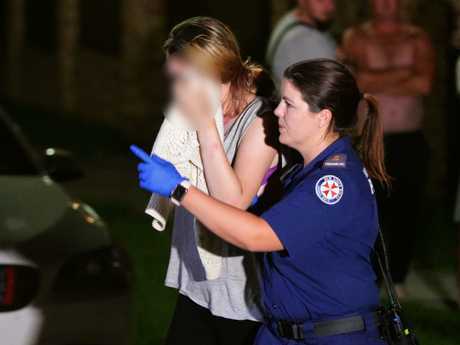 Two teenage girls have been arrested after they took a joy ride in a stolen car and crashed it into the front fence of a home in Sydney's west. A resident was forced to make a citizens arrest after the girls allegedly attempted to flee the scene. Police were called to a home in Guildford at about 10.50pm yesterday following reports a car had lost control and smashed through a fence. The 15-year-old driver and her passenger, also 15, allegedly fled the car but were detained by a neighbour. Police say the car had reportedly been stolen from a house in Smithfield in late January. The two girls suffered cuts and abrasions in the crash and were taken to hospital for treatment. They have been released from police custody pending an investigation. Drug kingpin Tony Mokbel remains in a critical condition in hospital, a day after he was viciously stabbed inside a Victorian prison. 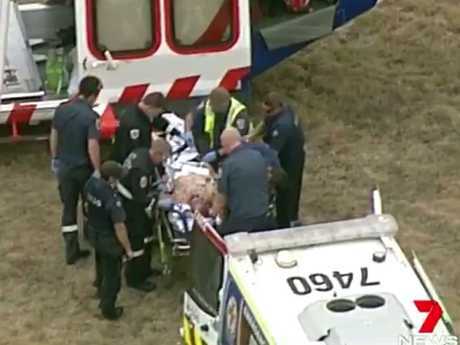 Aerial footage from Barwon Prison on Monday showed Mokbel bare-chested as paramedics rushed to his aid after reports the 53-year-old was stabbed in an exercise yard on Monday. The 53-year-old was originally in a serious but stable condition, but Royal Melbourne Hospital later upgraded his condition to critical. A 31-year-old inmate was also transported by road ambulance to hospital in a serious condition. No prison staff were injured. But the lawyer informant scandal has opened a possible window for Mokbel to appeal. A P-plate driver has learned the hard way not to mess around with trucks after dashcam footage captured the moment the youngster made a very dangerous decision. The video shows the blue hatchback pull onto a two-lane road, right in front of a truck travelling at high speed. The truck driver slams on the breaks but in unable to slow down fast enough and rams the back of the car, pushing the P-plater onto the median strip. The car eventually skids to a stop, with the driver appearing to be unharmed. He then tries to get out of the car without putting the handbrake on, almost letting the vehicle roll back into oncoming traffic. Social media users flocked to the comments to berate the inexperienced driver. "Two lanes and he pulls out in front of a fast moving truck?! Hand your license back," one person said. Another wrote: "Bloody idiot … shouldn't have a license if they're going to be that stupid behind the wheel. Truck driver did well to not have a catastrophic incident happen." Motorists travelling in western Sydney are being urged to allow for extra travel time this morning as emergency road works take place in Colebee. One of two eastbound lanes is closed on Richmond Rd heading towards the M7 due to the repairs. Traffic is very heavy and building up in the area. Drivers are being told to use an alternative route if possible. 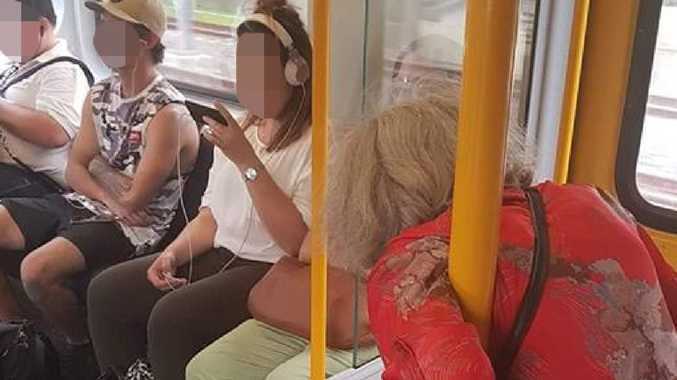 A photo of an elderly woman standing on a train while a group of young people sit down and seem to ignore her has divided opinion. 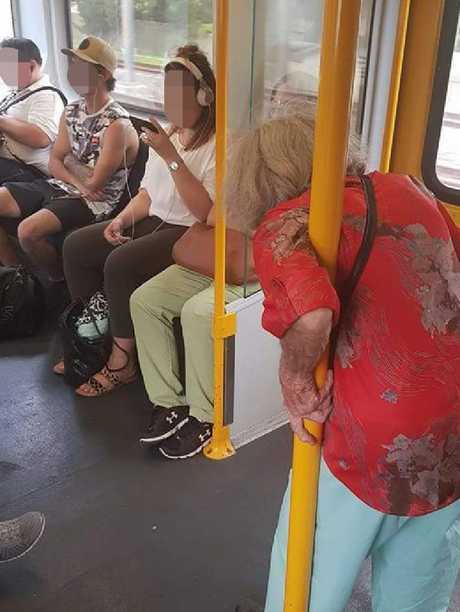 The confronting snap was posted to Facebook group Aussie Aussie Aussie Aussie with the caption: "No respect". It is unclear exactly where the photo was taken but it is believed to be somewhere in Sydney. The picture caused outrage among many social media users and was shared over 27,000 times. 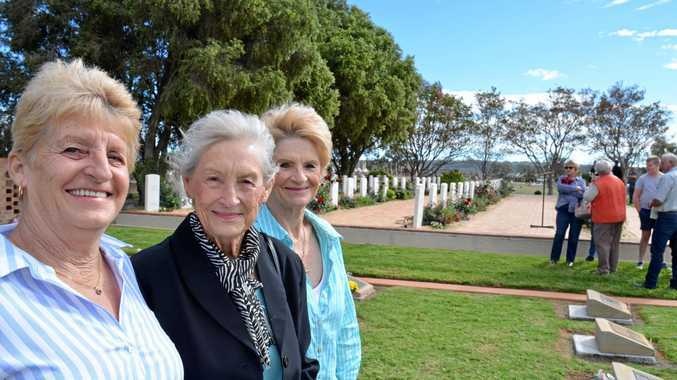 "Gone are the days where the younger generation look after for their elders," one person said. "This disgusts me, why aren't people asking others to give their seat up," another asked. One added: "What pigs. Should be ashamed of themselves." There were some people who blamed the photographer for not doing something instead of standing back and taking photos. "Why not man up and say something to them instead of taking a pic to get likes," one person said. However not everyone was immediately outraged by the photo, with some suggesting there could be another side to the story. "So quick to judge, but no one knows the story behind the picture. A whole train full of people and not one person offered a seat. Unlikely. Way to go to the person who took this picture just to incite hatred of the younger generations," one Facebook user said. Another suggested: "Maybe she was getting up ready to get off? Maybe she was offered a seat but refused?" Temperatures are set to reach a sweltering 37C in Sydney today. 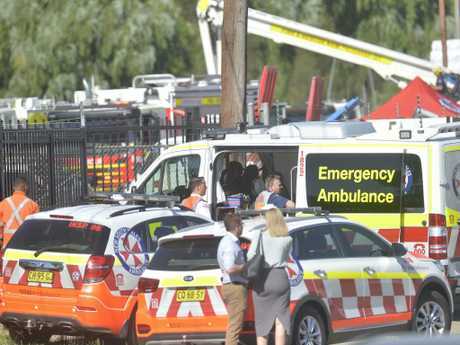 An investigation has been launched into the death of a roofing contractor who was electrocuted after touching live wires while working in Sydney's west. The 24-year-old man was working at Moorebank alongside four other men when the incident occurred before 2pm on Monday. It is understood the man was holding a metal pole when he brushed against electrical wires near the building and was electrocuted. The four other workers were rescued from the roof, with one man suffering severe burns to his legs. Authorities had to shut off the power before they could declare the man dead and free his body from the site. Police and SafeWork NSW are investigating the incident.